On nights that Brent works his late shift I like to make meals that don’t take a whole lot of time and effort (or uses a lot of dishes) so that I have time to take care of chores or homework. A lot of times I make some sort of breakfast for dinner or an easy one pot pasta dish. One of my favorite go-to meals is some form of taco. 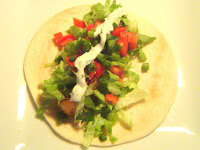 I’ve made these tacos several times and it only occurred to me this morning to share them with you. 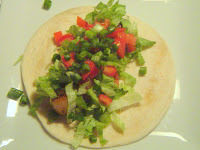 Sometimes I go really simple and just top them with lettuce and salsa if that is all I have on hand. So this is really more of an idea to share really since you can change them up however you like! 1. Make sure your scallops are thawed and clean. Place in a small bowl and top with Cajun seasoning. I like a good amount of spicy flavor so I go with 2+ teaspoons, if you don’t like as much, go with less. Allow to sit for at least 5 or so minutes. 2. Heat pan to medium heat and add just enough oil to coat the bottom. 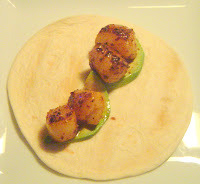 Add scallops and cook for 3-4 minutes per side. 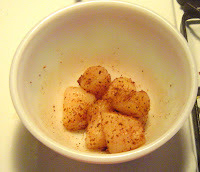 Scallops will start to brown and caramelize slightly. And finally your cilantro sour cream. 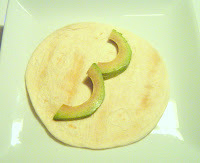 Serve with a lime wedge if you wish! Thoughts: Quick, easy, and a lot of flavor. So easy in fact that I basically made them in the dark since my kitchen light decided to blow as I started cooking =/ They have wonderful “fresh” and healthy feel to them, but are still very satisfying and filling. 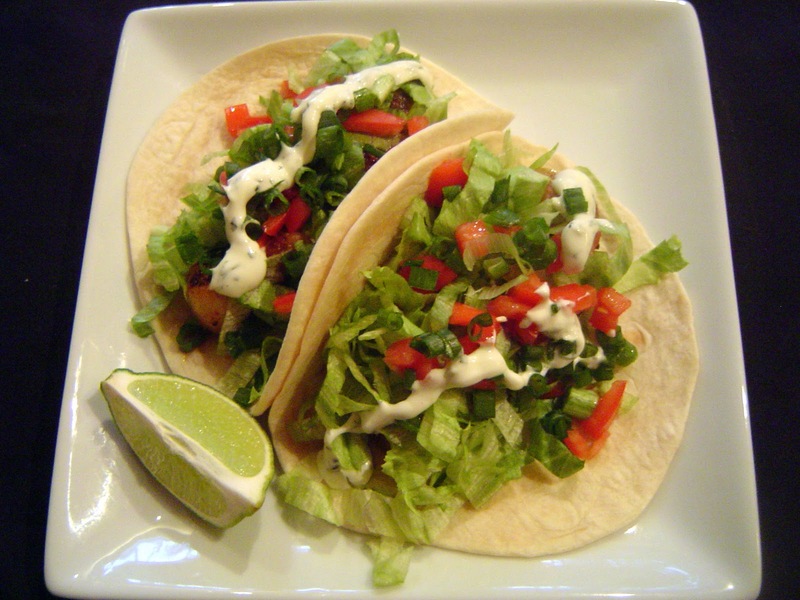 The Cajun seasoning gives a good amount of heat to the tacos, and the veggies pair nicely with it adding a crisp cool crunch. If you like fish tacos you will love these. I had the cilantro sour cream on hand from making the beef empanadas so I will be sharing the recipe for that later this week with the empanads! 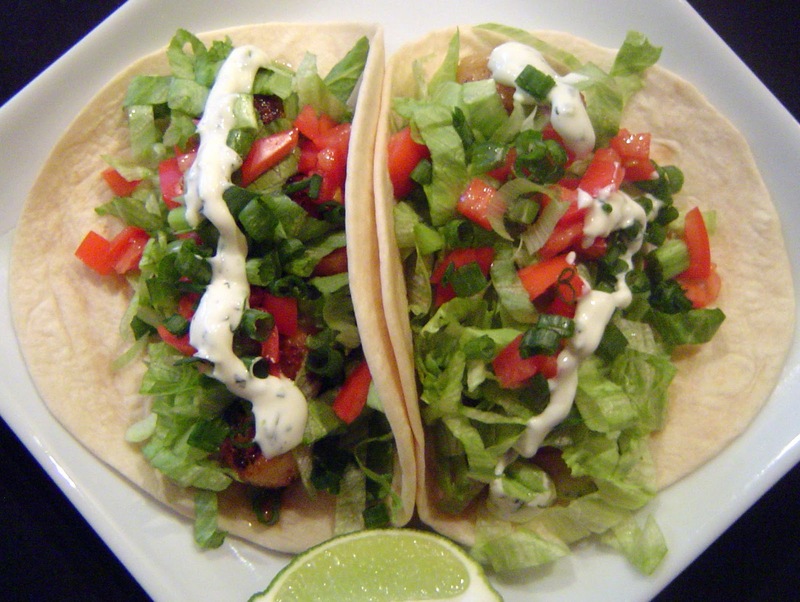 oh those tacos look delicious! this is the recipe I was excited about! Wonder if I can find scallops here.